If it wasn't a friend from Samut Songkhram, I wouldn't have the fortunate chance to visit Amphawa. The truth is, as a Malaysian, I had never heard of the name, let alone to visit. But to my pleasant surprise, Amphawa has turned out to be one of my favorite places that I have visited in Thailand. Amphawa is a district located in the province of Samut Songkhram. It is about 60km away from Bangkok. It makes a nice day trip from Bangkok. 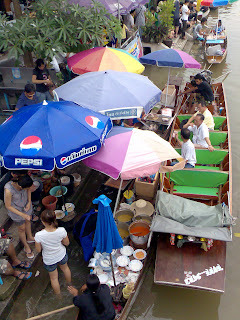 The more popular Damnoen Saduak floating market is nearby. So, you can throw two birds with one stone if you pay a visit to Samut Songkhram. The first time I visited Amphawa in May 2008. I visited Amphawa in mid afternoon, there wasn't many tourists at all. We parked our car and walked towards a coffee shop. I didn't know that the the back (or was it the front?) of the coffee shop actually opens to a canal. The canal is like the main street on the small town. On both sides of the canal, there are rows of old houses facing the canal. There is a walkway that links each houses and shops. Visitors can walk on the walkway from one shop to another. There are staircases that lead to the canal. My friend told me that the water level will rise in the late afternoon. Therefore, Amphawa floating market will start later in the afternoon. Well, due to time constrain, we didn't stay late enough to see the floating market. But I definitely enjoyed my 2 hours stay in Amphawa. 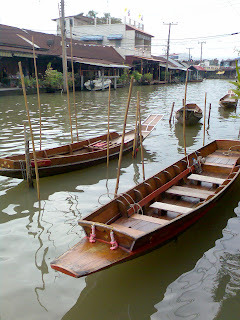 In November 2008, I visited Amphawa again. On my second visit, I still liked it. We walked in a market and had lunch by the canal. The atmosphere was relaxing and nostalgic. It was as if I had gone back to 20 or 30 years ago. In Amphawa, you can find old fashioned toys that were popular 20 years ago. There are some homestay at Amphawa. I saw on some pictures that monks row a small boat to collect food donation in the morning. I would like to see that one day. Perhaps I will stay for one night and get the relaxed weekend away from hustle and bustle of Bangkok. Although thee are many visitors in the weekend, I hope the town doesn't get overdeveloped. It is charming the way it is now. Thanks for stopping by Nessa. :) Please visit again.